Happy Wednesday! Hope everyone's week has been swell so far. Due to our unexpected Snow Day on Monday, my week has been kinda blah to be honest. It is hard to get work done with the weather the way it is, because all I wanna do is relax on the couch. & plus, since I tweaked my knee on Saturday, I haven't done too much moving around. Last night, I did manage to get out of the house & grab happy hour drinks with some fellow blogger friends & my knee is def. not happy with me. Today, I will be taking it much easier & poppin' the motrin all day, with an occasional dose of ice on my knee (yay!). I am just praying that my knee heals quickly so that I can get back to my normal activities & not have to walk up + down the steps like an old person (sorry Granny!). Anywho, here is this week's dose of Four Favorites. I am not 110% sure if I can rock this Bando twist scarf, but I sure do envy those that can. It is so pretty. Boden has some THE cutest clothes & I am def. loving this green rain jacket! It certainly will make running errands in the rain more bearable. Lace up espadrille in stripe! Why yes, I will take a pair of you & these polka dot ones too. Loren Hopes jewelry is by far some of my favorite & I am pretty sure I wear atleast one piece of her jewelry daily. Her pieces are so unique & I want them all, especially this Mia cuff in Bloom. 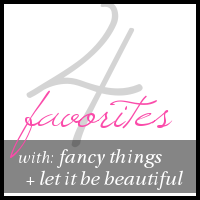 The Four Favorites link-up is held on Wednesdays and there aren't any rules, but we would really appreciate it if you followed both Kristin + I, as well as share the button on your Four Favorites post!